There are two broad types of taxes: direct and indirect. Direct taxes are charged directly by governments, usually on income. This facilitates progressive targeting, taking more from high earners and alleviating the burden on the poor. Indirect taxes (e.g. VAT, GST, fuel and tobacco levies) are charged by anyone providing a good or service upon consumption. And the 7–Eleven down the street doesn’t know whether you are rich or poor. So a chocolate bar will incur a 20% tax, whether you earn £10,000 or £100,000. The impact of indirect taxes depends on how much you earn. Unfortunately, the less you have the more it impacts. While income tax progressively increases as your income increases, consumption taxes are regressive. As a result the poorest 10% of UK’s households spend a third of their income on indirect taxes. The richest 10% on the other hand only spend £1 of every £10 they earn in indirect taxes¹. The impact of these regressive indirect taxes are such that they cancel out the progressiveness of the income taxes. That is, once both sets of taxes are considered; households across the UK’s income spectrum contribute the same amount relative to their income. In fact, the poorest 10% of households contribute 10 percentage points more than any other income group. This trend grew drastically from the late 70s till 2002, and appears to have plateaued since. But it does not appear to be disappearing. … the UK got rid of indirect taxes. What if it raised the same revenue as it does today entirely through income taxes, using its current progressive pattern? To put the Gini value in perspective, the estimated 0.26 value would put the UK among the most equal countries, alongside Norway, Finland (based on UNDP figures²). Removing the VAT by itself would make a significant impact, as it accounts for almost half of all indirect taxes. Granted, moving to an entirely direct revenue raising system is neither likely nor simple. But this ridiculous scenario does highlight just how unequal the indirect taxing system is, and what impact it has on equality. It also suggests that every new or increased indirect tax implemented continues to drive a wedge between the haves and the have-less. This includes the increases in VAT from 15% to 17.5% to 20% over the past 25 years, and any additional levy. Similarly, if a key aim over the coming years is to decrease inequality, then there may be worse places to start than by lowering VAT, and compensating where necessary with increased income taxes. In the aftermath of Brexit, the pointy finger of blame has fallen squarely on the rise of conservative patriotism, racism and the stench of economic stagnation among the working poor. But when analysing the economic situation of UK’s households over the last few decades, it’s hard to see what Brexiters are complaining about. While American working class wages got stuck in the 1970s, the UK’s have been rising steadily, especially since 1990. In fact since Thatcher lost office, the poorest 40% of households have seen their disposable income increase at twice the rate of the rest of the country. After adjusting for inflation, household disposable income grew by 71% for the poorest 20% of households, and 59% for the 2nd poorest since 1990. The rest of the UK only grew by 34%. The poor are not only getting richer in absolute terms, but also in relative terms. The poorest quintile has seen their disposable income increase from £7,200 in 1990 to £12,300 in 2014/15 (after inflation). The second poorest quintile increased from £12,400 to £19,800. No matter how hard life is today for poor households, it would be a lot worse with £6,000 less a year. To put this growth in perspective, we can compare today’s poor households to that of people in the past. Today’s 2nd poorest quintile earns the same as the middle quintile earned in 1990. And going back a bit further, they earn the same that the 2nd richest quintile did in 1977, just before Thatcher took office. So, the economic situation of the working class today is similar to that of the upper middle classes when the (Royal variety) Queen celebrated her Silver Jubilee, and Queen (of the Freddy Mercury variety) released “We are the champions”. As the poor households’ earnings grew faster than the rich ones, the relative gap has decreases considerably. The disposable income ratio of richest to poorest was 7 at the end of the Iron Lady’s regime. Today that figure is 5.4. Likewise, the ratio between the 2nd richest and 2nd poorest quintiles dropped from 2.4 times to 2.0. Of course, the ratio is still too large, but a 23% drop is worth noting. The figures above look at the UK since the departure of Lady Thatcher in 1990, but what about a more recent focus? Well, the picture is even rosier (relatively speaking) for the lowest quintile over the past 7 years. While the richest 2 quintiles dipped between 5-10% around 2011-12, and have only just returned to pre-crisis levels, the poorest quintile now earns 11% more than they did in 2007/08, and never went behind pre-crisis levels over the period. The 2nd lowest earners hovered steadily, but over the past 2 years increased to a small increase over pre-crisis levels. A longer search shows that this was not always the case. The last dark age for the lower classes was clearly under Thatcher. During Margaret’s 11 year regime, the disparity between rich and poor climbed steeply. While the richest households in the UK experienced a 46% increase in real disposable income, the poorest 2 quintiles only increased by 11 and 13%. This resulted in the income ratio of richest to poorest to rise from 4.9 to 7 in an 11 year period. It’s taken the following 25 years to bring this disparity back to pre-Thatcher levels for 2nd richest to 2nd poorest, but the Richest to poorest ratio is still much higher than it was in the late 70s. Here’s where it gets super interesting. It would be easy to assume that seeing as the end of Thatcherism marked the turning point for income distribution; government handouts would be somewhat responsible for the change. But that is far from the truth. The income growth for the poorest has been largely driven by increases in private income. Since 1990, private income for the poorest has increased by 168%, while Government support only increased 22%! The opposite was surprisingly true under Thatcher, when the bulk of the poor’s income increases came from government benefits. Since 1990, Government support has increased the least for the poorest quintile, in relative AND absolute terms. While the government now gives the poorest quintile £1,400 more than they did in 1990 (after inflation), they also give middle income earners an extra £3,400, and the richest quintile an extra £1,700 per year, after inflation. Yeah, nah. Unemployment has not been lower than current rates since the mid-70s. Sure there was a momentary blip from the 2008 crisis, but not only did that not reach the unemployment levels seen in the 80s and 90s, it also finished a year ago. People should be high on finding employment at the moment. Even income tax hasn’t been lower in the last 40 years. The poorest households now pay 5 percentage points less in tax than they did 25 years ago, and the middle and upper middle classes have dropped around 3 percentage points. The only section of the community paying more tax (per household) are the richest 20%, and even they only pay less than 1 percentage point more than they used to. So, what the heck are Brexiters complaining about? Overall the economic situation in the UK has been favourable across the community, and in particular the poorest sections. Brits have not paid less in taxes in at least 40 years. Furthermore, the government is increasingly supporting the middle and upper classes through direct cash benefits, so they can hardly complain about the support being handed out to those (arguably) more deserving. If Brexit was a vote of discontent at the current economic situation, it was a result of perception more than reality. More likely, it was a vote from fear. A xenophobic reaction to the constant hysteria bombarded at the populous, misleading on the current situation. The world is not getting worse. Neither from within, economically, nor from outside evils. Time for more reasoned responses, from a better informed community. All data is sourced from the Office of National Statistics (ONS) UK. There is no correlation between an electorate’s socio-economic standing and its preferred political party, at least not in the 2013 elections. The simplistic view of politics suggests one party proposes policies which help poor people and the other party angles to improve the lives of those more fortunate. Yet, in Australia, the socio-economic make-up of an electorate is a very poor predictor of which party will be voted in, at least not nation-wide. It seems Labor electorates are not the working class suburbs usually portrayed, and Liberal electorates aren’t the prime real estate so often generalised. This is clearly seen when focusing on the top 10 Liberal/National coalition seats. As the graph above shows, the ‘rich’ are grossly under-represented in the top 3 ‘liberal/national’ seats, and in three more of the safest Liberal seats. On the other hand, they are hugely overrepresented in the other 4 of the top 10 seats (averaging 85% of each overrepresented electorate). As an example, Mallee, on the NSW/Victorian border, has the highest Liberal vote, yet over 50% of the population falls in the bottom 30%, and only 6% are considered in the top 30% of Australia. Similarly, there appears to be no relationship between party allegiance and private schooling. For all the apparent willingness of the Liberal party to support private schools, areas with a high percentage of kids attending private school are just as likely to vote blue as they are red. While it seems there is no link between ‘class’ and politics Australia wide, a relationship does exist within capital cities. Filtering out electorates which have less than two-thirds of its population within a capital city (using ABS’s remoteness divisions), a correlation of 0.51 appears between the Labor vote and areas with high proportions of low socio-economic households. This means that the larger the percentage of ‘lower class’ households in an electorate, the more likely Labor is to win the seat. Similarly, the more rich households there are in a city electorate, the more likely the Liberal Party is to win. No such link appears to occur outside of the major cities, neither in regional cities nor in rural areas. So, are parties not catering to one side over the other, or are constituents unable to discern how each party’s policies will affect them, or do people not vote based on what may benefit them? Or is politics a whole lot more complicated than that? Socio-economic and School attendance from ABS, Census Statistics. For as long as I can remember it’s felt like we’ve been breaking down barriers and tearing down the regimes of acceptability. Traditional roles are no longer the norm, travelled by choice not momentum. Everybody’s road-fork a choice to be made. But despite the changes, work occupations are still bastions of gender segregation. Clichés and stereotypes such as tradies are men and teachers are women may not help fight outdated and ingrained social expectations, but they’re still the case in Australia, according to the latest ATO figures for 2013-14. Based on self-identified information from tax returns, there are 52,305 carpenters in Australia, of which only 127 are women. Similarly, only 94 of the 34,362 plumbers are women. That’s 0.2% and 0.3% of each occupation. To simplify the situation using a popular meme: if Australia were 100 carpenters (or plumbers), none of them would be women. Not one. While I expected clichés to imitate life, I assumed they were exaggerating. What kind of impact is this environment and constant reinforcement having on half of all men? If we are to break down the gap between sexes, either roles need to become a lot less “gendered” or occupations need to become a lot more evenly rewarded. 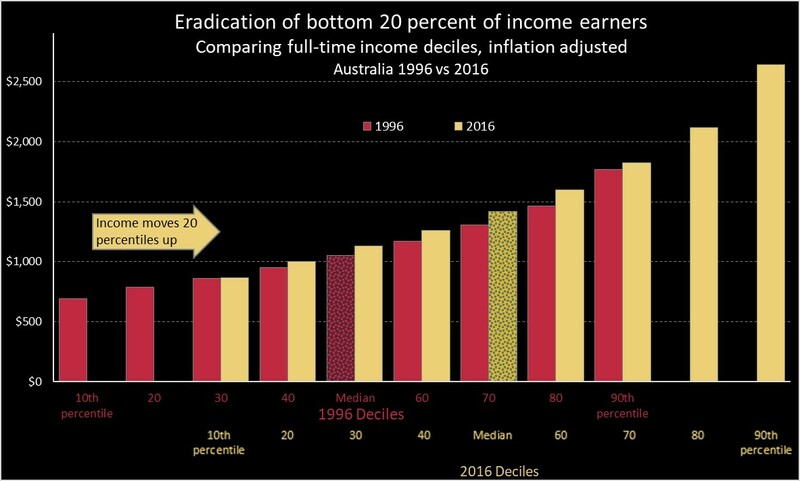 Whilst some movements has been made towards more equal distributions in the past 30 years, the information above shows there’s a huge way still to go. All figures based on ATO statistics for 2013-14, Individuals Table 14A&14B. 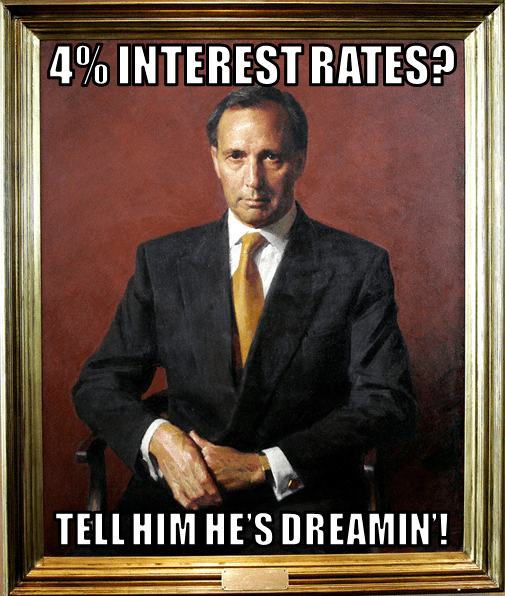 In 2013-14, the Australian Government dispersed a Robin Hoodesque $105 billion across the community through income support payments. That’s roughly 30% of its tax revenue. Unlike Robin, however, Kevin, Julia, Tony and their merry men gave much of their loot to the most fortunate, rather than to the poor. Based on research conducted by the Australian Productivity Commission, the wealthiest half of households received just as much income support as the poorest half. And whilst the poorest decile (10%) received the most support, those in middle upper wealth households (50th to 80th percentile) received the lion’s share. The distribution of government support to wealthy households is largely driven by Aged and Family pensions, whilst Unemployment, Study and Disability payments go some way to balancing out the situation. Newstart allowance (a.k.a. the dole) and Study Support programs are tightly targeted based on income and wealth of the recipient. Disability payments are also largely provided to less wealthy households. This leads to claims that the Australian Welfare system is one of the most targeted in the world. However these two payments only make up 7% of all income support provided by the government. The majority of the loot is given away in the form of Aged Pensions (44%) and Family Payments (26%). Unlike the dole, Aged Pensions and Family Payments are much looser in their targeting. As a result, more of these benefits are paid to the top wealth brackets than to the poorer households. Unfortunately, this appear to create an entirely misguided system in which the wealthiest households in Australia receive more welfare than those with limited resources, to the extent that the amount paid in Aged Pensions to the top 20% of households is $1.2 billion more than the entire unemployment benefits. This is not to suggest that pension need cutting, nor that the Australian welfare system is over-inflated. Rather that we’re failing to funnel funds to support those in the greatest need. Seeing as they are one of life’s two certainties, how is it that we’re so ignorant about taxes? The federal government updates the income tax system roughly every second year, more often than not announcing tax cuts. This kicks off a war of sound bites over who is prepared to deliver the deepest cuts and for whom. What they rarely provide, however, is a clear and simple indication of what the impact of each tax plan will be on one’s paycheck. While providing the intended tax brackets allows people to conduct the necessary analysis, I doubt most people would bother to do so, thus making assumptions on the impact of the changes. Since converting the national currency to the Australian dollar in 1966, the average income has increased from just under $3,000 dollars per year to almost $55,000. Although the rate of growth has fluctuated, it has constantly been positive, with no year posting a negative growth. Due to the combination of Australia’s progressive tax system and the continuous income growth, a government’s failure to update the tax system quickly translates into a tax increase. For example, a person earning $50,000 this year is likely to earn around $51,500 next year due to income growth (average growth of around 4% per year since 1990). This growth puts a larger percentage of their income in a higher tax bracket than before, therefore increasing their overall tax rate. 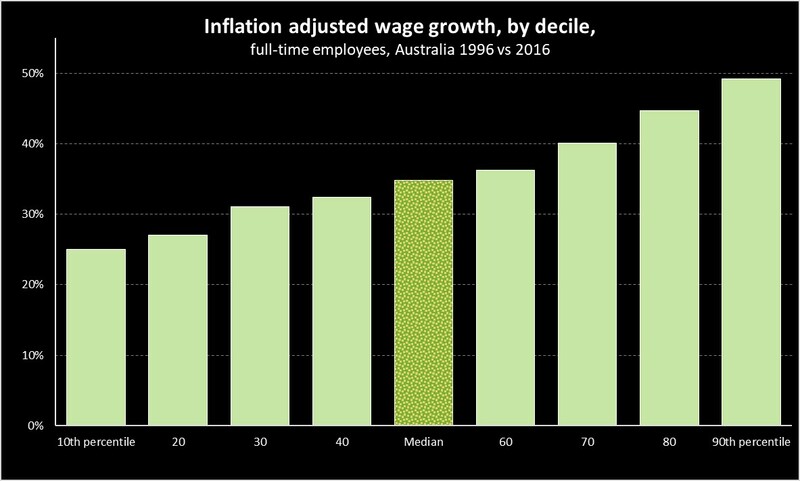 The graph below shows what would have happen to a person earning the average wage every year, had the tax rates been frozen in 1990-91. Although the difference is small from one year to the next, a twenty year time-line clarifies the point. While the average income in 1990 was $25,910 (falling within a tax bracket of 38.5%), 2011’s average income was $54,700, attracting the top tax rate of 47% back in 1990. Income tax is a complex beast with many aspects including levies and rebates changing year to year. In an attempt to simplify the history of income tax in Australia, the following graph displays the percentage of tax paid for different multiples of the average wage from the inception of the Australian dollar onwards. *The resident Prime Minister is only indicative, as their timing doesn’t line up nicely with the financial years. Other than a very curious bump in the late seventies*, the years since have not provided much excitement. The slow and gradual “ramp-up” through the nineties is explained by almost a decade of non-updated tax rates, similarly to a small bump in the early to mid ‘naughties’ (2001-2004). Otherwise it has been a steady decrease of income taxes since Malcolm Fraser’s first term. Generally speaking, income taxes have decreased over the past few decades. This decrease, however, is not evenly spread across the pay brackets. While the average wage now gets taxed about 4 percentage points less than thirty years ago, people earning 3, 4 and 5 times the average wage have experienced decreases of 9, 11 and 12 percentage points. This trend is even more pronounced if we used 1985-6 as the base year. 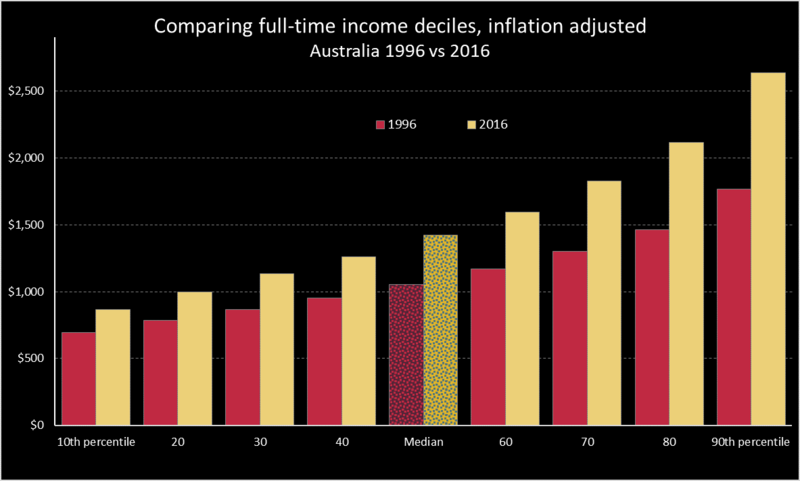 Since Hawke’s first term in office, income tax on the average wage has decreased 2 percentage points, while those earning over 3 times the average wage have experienced a 14 percentage point drop in their income tax! Interestingly, people earning half the average wage are still paying roughly the same levels of tax as they did in the late 70s, hovering around the 12%. Of course, none of this includes the impact of tax breaks for Low Income Earners, nor does it include negative gearing or other benefits offered through our tax system. It is purely a simple model of calculating income tax percentages, by different multiples of the average wage. The picture it tells appear lopsided, though mostly because there seems to be no other side in modern Australian politics.